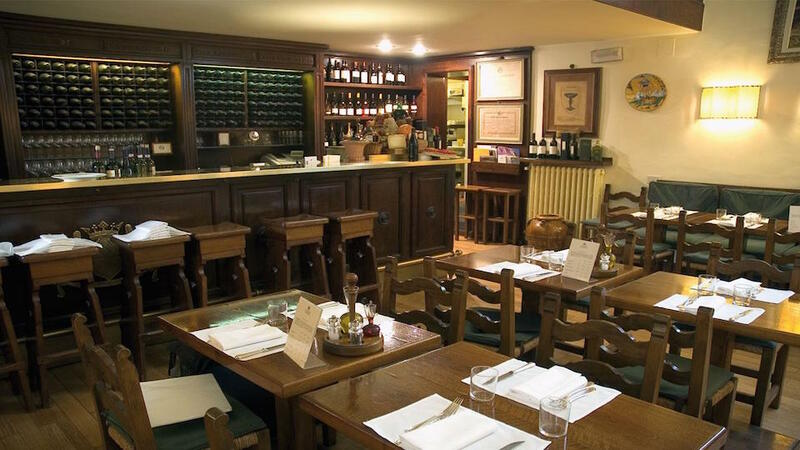 Cantinetta Antinori began as a wine empire generations ago and their namesake restaurant and wine bar is charmingly located in the family's 15th century Florence palazzo. The surroundings are supremely intimate and romantic, with a hushed atmosphere, vaulted ceilings large enough to contain a loft dining area, and waiters in crisply pressed cream jackets who deliver service to the highest of Continental standards. Seasonal Tuscan classics are the heart of the menu, bold dishes prepared according to Italian tradition. Begin with pappa al pomodoro (tomato and bread soup) to prepare your palate for greater indulgences. House specialties include Florentine steak, fettuccine all'anatra (noodles in duck sauce), and gran pezzo, which is a thick and savory cut of Chiana beef. Save room for dessert, the menu is extensive and filled with indulgent offerings, including grape cake and warm pear torte. Wine, of course, is a major attraction. The family wines are extremely well regarded and obviously have a prominent place on the menu. The selections are worth exploring and the servers can assist in choosing wines properly paired with each dish.